With this message, Guillaume Faury, Executive Vice President of Research & Development at PSA Peugeot Citroën, welcomed 100 business and political decision makers, partners and journalists to the Group&apos;s Automotive Design Network (ADN) R&D centre in Vélizy, France for its Innovation Day. During the event, guests had the opportunity to discover several game-changing technologies developed by PSA Peugeot Citroën to meet the challenges facing the car of the future. In particular, the Group organised a world-premiere presentation of a revolutionary technology called Hybrid Air, a petrol and compressed air full-hybrid solution. During a press conference, Philippe Varin, Chairman of the Group&apos;s Managing Board, Guillaume Faury, Executive Vice President of Research & Development, Philippe Bouyoux, France’s Deputy General Commissioner for Investment Projects and François Loos, Chairman of the French Environment and Energy Management Agency (ADEME), unveiled a new type of full-hybrid powertrain known as Hybrid Air. This breakthrough technology, which combines a petrol engine and compressed air for energy storage, represents a key step towards the 2l/100km car by 2020. Participants were treated to a preview of the Group’s new global platform, Efficient Modular Platform 2 (EMP2). This new generation platform provides effective solutions in terms of modularity, equipment and carbon reduction. 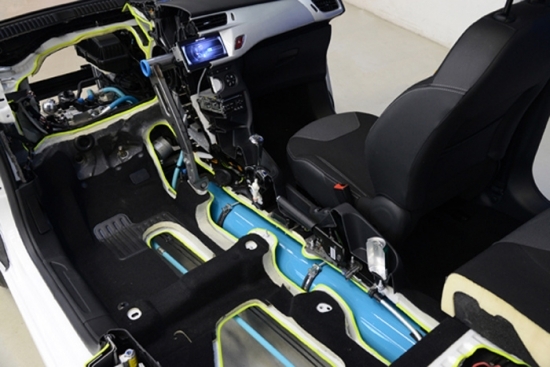 In 2013, PSA Peugeot Citroën will introduce selective catalytic reduction (SCR) to maintain its leadership in diesel engine efficiency and lower NOx emissions to the level of petrol engines. Because it is positioned upstream from the Diesel Particulate Filter (DPF) with additive, this unique technology makes it possible to both eliminate NOx and reduce fuel consumption (by 2 to 4% from Euro 5 levels). The use of this technology on petrol and diesel vehicles in the B, C and D segments will reduce CO2 emissions by 15g and cut fuel consumption by up to 15%. 60% of trips within cities are made in individual cars, with a resulting impact on CO2 emissions. VelV is a light electric vehicle project designed to meet city and suburban driving needs with a record power consumption level of just 85 Wh/km travelled.